It’s been a few weeks since there was a nice juicy promo from Sporting Index. In fact they tried to run one last week that I was going to play, but it got pulled due to "technical issues". I was a bit worried they’d realised they were giving too much away, but the same deal is back this weekend: net losses refunded on their new virtual game up to £50. Weekends apparently now start on Thursday morning too. 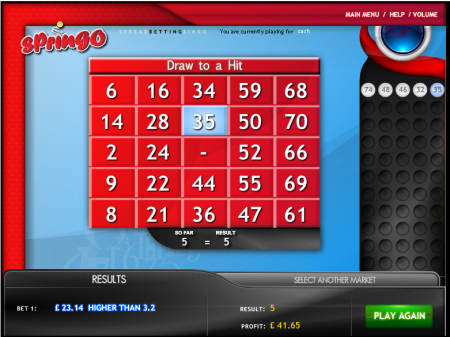 Springo is a spread betting game based on bingo where you can bet on all sorts of wacky number things. There’s a card with 24 numbers and balls are drawn from 1-80. You could bet on how many numbers on your card are matched in 55 balls drawn (the spread is 17.4 to 17.8), or how many balls are spat out until your first hit (2.9 to 3.2). You can also gamble on whether the numbers you match on your card form a particular patterns, like a plus sign, bullseye or heart. Or for the truly degenerate, you can play one of the markets where numbers are multiplied together to get that oh-so important volatility. The spread for "First hit x Last hit" is 1385-1405 – bet £1 per point and you could win £3845 or lose £1385. So here’s how I played it. There’s no even money bet in this game, or even anything that’s equivalent to fixed odds. So I took the least volatile market and the smallest stake possible: I played "Draw to a hit" ten times, buying at 3.2 for the minimum stake of 91 pence per point. That bet meant the worst downside was £2 each game, with a maximum theoretical win of £43.50. The maximum likely win is much, much lower, as you’d have to draw 55 balls without hitting a single one on your card and that doesn’t leave much room for error. That’s every single number you don’t have except one. It’s so unlikely, in fact, that I can’t even be bothered to start working the odds. Astronomical. But there’s still the chance of a decent win for a controlled stake if things go the right way. The first two games I played I matched the very first ball. That £4 maximum loss was not a good start, but playing this strategy it all comes down to the last game anyway: just try to lose as little as possible until you’ve qualified for the refund and then lump whatever you have left on one bet. Or, if you win during the qualifying period, you can just take that money and leave. After 10 spins I was actually up by one unit: a massive 91p profit. But I decided to let it ride. Buying for a pretty random £23.14 per point meant the maximum downside was £50.91 – perfect. The result was a good one too… five balls before a hit! A 1.8 unit win, or £41.65 in real money. Kerching!